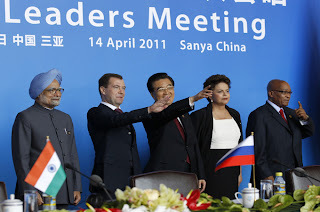 Ist it Pentagon/NATO versus the BRICS? Pepe EscobarBoth sides are staking out their territory across the Middle East as BRICS countries warn the West about interventions.Few may have noticed when, last week, US State Department spokeswoman Victoria Nuland cryptically announced that Washington "would cease carrying out certain obligations under the Conventional Armed Forces in Europe (CFE) Treaty with regard to Russia". Translation: Washington will not inform Russia from now on about the redeployment of its global armada. The Pentagon's worldwide "repositioning" strategy is now supposed to be a secret. Some essential background is in order. CFE part one was signed way back in 1990 - when the Warsaw Pact was still in effect, and NATO was supposed to defend the "free" West against what was depicted as a threatening Red Army. North Atlantic Treaty Organisation (NATO) has not offered to provide ballistic missile shield to India against any possible enemy attacks, Defence Minister A.K. Antony said on November 30. He informed parliament that India has not received any offer from the NATO for a partnership in missile defence programme. In written replies to questions in the Rajya Sabha, he also said that India has also not received any offer from the US for partnering in the F-35 Joint Strike Fighter (JSF) plane programme. Antony was replying to questions whether the NATO was willing to provide India missile cover from enemy attacks, whether the US-led alliance had invited New Delhi to become a partner in its missile defence programme, or whether the US had offered it a partnership in the development of the F-35 combat plane. Congress's T. Subbarami Reddy of Andhra pradesh, with total assets worth Rs.258 crore & who is Chairman, Parliamentary Standing Committee (PSC) on Science & Technology, Environment & Forests claims, he has no financial interests! New Delhi, Nov 17 (IANS) A total of 140 out of the 241 members of the Rajya Sabha claim that they have no financial interests, despite owning assets running into crores of rupees, said an activist Thursday. Prime Minister Manmohan Singh has also declared no financial interests, but has assets worth more than Rs.4 crore. 'It is strange how one can have huge assets and no financial interests,' said Anil Bariwal, national coordinator of National Election Watch (NEW). An analysis of data on MPs' financial interests received from Rajya Sabha by NGOs NEW and Association for Democratic Research (ADR) showed a large number of them having share or control in private firms or enjoying financial gains from firms or other professions. New Delhi 11/11/2011: Quite like prisoners whose biometric data like finger prints can be collected only under the Identification of Prisoners Act, 1920, it is quite outrageous that National Population Register (NPR) is taking biometric data of every resident and citizen of India disregarding absence of any legislative mandate for it. In the case of prisoners their biometric data is required to be destroyed on their acquittal but in the case of NPR and Centralized Identities Register (CIDR) of Unique Identification (UID)/Aadhaar Number, the same will be recorded for ever. Are residents and citizens worse than prisoners?